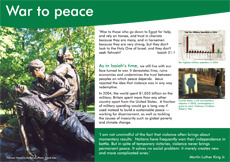 How does a faith-based commitment to peace take shape? 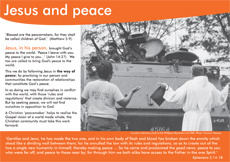 The ‘What is Peace?’ exhibition presents the meaning of peace from an ecumenical Christian peacemaking perspective. 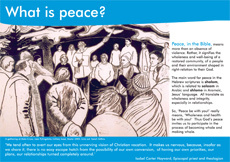 The exhibition is made up of 8 panels and is available in large A1 (borrow for free) and smaller A3 (buy for £25, borrow for free) formats. 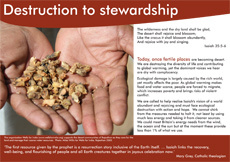 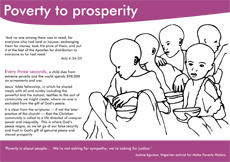 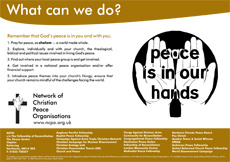 It is an excellent resource for use by church and community groups, peace and justice groups and individuals. 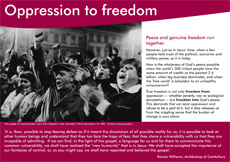 The exhibition can be viewed below. 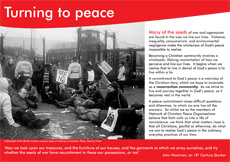 Contact Kat Barton at QPSW (disarm@quaker.org.uk; 020 7663 1067; www.quaker.org.uk/qpsw) to buy or borrow the exhibition, or simply download all the panels and print it out for free.